Sharp, whistled “tew” and a musical twitter. Warbling song heard only on breeding grounds. 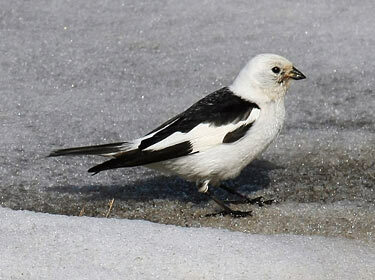 Description: Bill is black in summer, orange-yellow in winter; large white wing patches. Breeding male is snow white with black back, shoulders, tips of flight feathers, and tail. Winter male is white with buffy crown, ear patch, collar, and back; black tail, primaries, and shoulder patch. 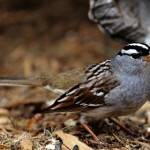 Breeding female has brown and sparrow-like upperparts; light brown streaking on head; and white underparts. Winter female is duller version of winter male. Juvenile is similar to breeding female but has grayish wash on head and breast. Habitat: Migrants and wintering birds are found on open plains, roadsides, and snow-covered fields. 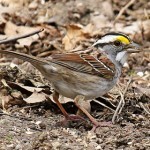 Where in Nebraska: Rare winter visitor, mainly in northern counties. 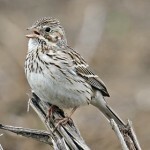 Field Notes: Often seen in large flocks amid Lapland Longspurs and Horned Larks. Fun Facts: The Snow Bunting places its nest in rock holes or crevices, so while it is relatively safe from predators the nest must be well lined to fight against the cold.